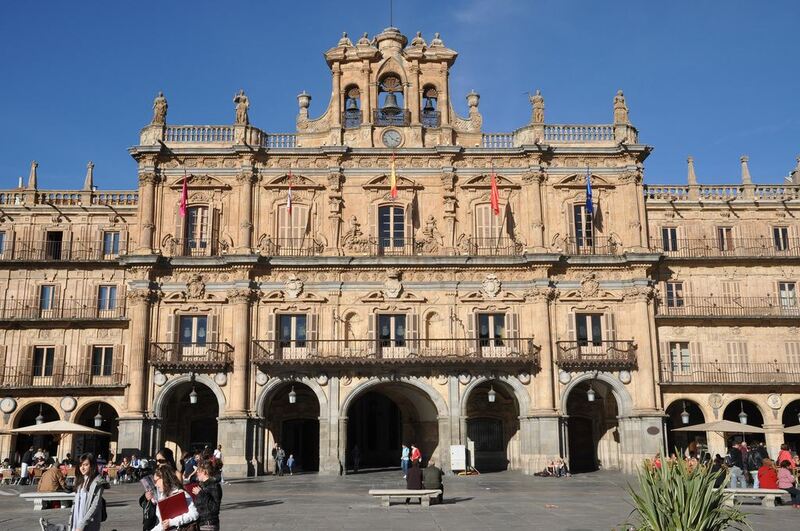 1.Salamanca’s Plaza Mayor was built in the 18th century using a late Baroque design by the architect Churriguera who is responsible for the new cathedral in Salamanca also. Underneath the clock is the meeting place of choice in the city. In the summer you’ll find concerts taking place in the evening time. It’s almost prettier at night – the lighting is gorgeous – but you can’t see the dusty golden-coloured brick so well. 2. Cordoba’s Plaza de la Corredera is a 17th century Baroque plaza. Roman mosaics found on this site suggest the location was once the entrance to a Roman amphitheatre. 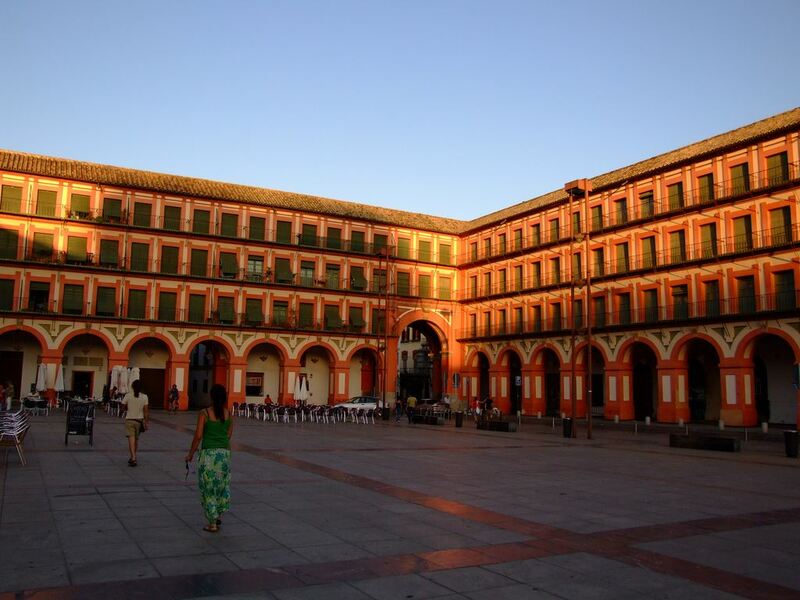 For many Spaniards, this is their favourite square. We love it for its colour. 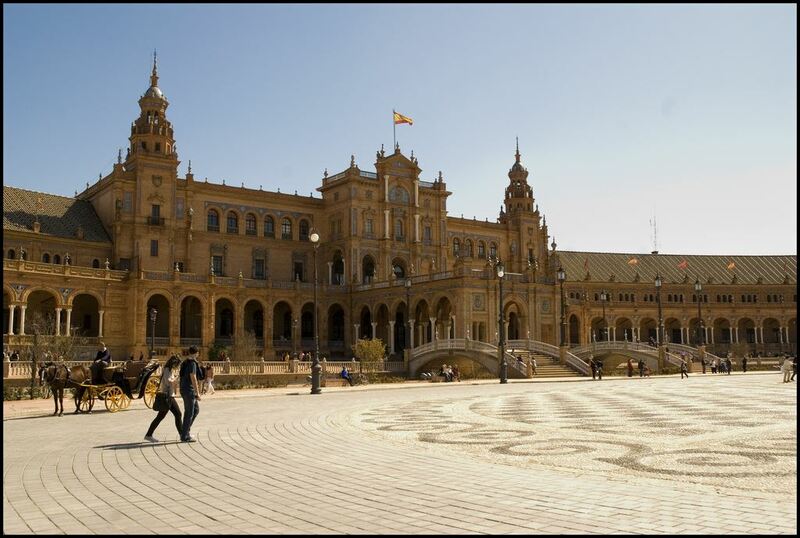 3.The Plaza de Espana in Seville was designed for the 1929 World Expo held in Seville. Underneath the semi-circular arches are benches representing each of the regions of Spain. If you are a fan of Star Wars, you’ll recognise this plaza and it’s cropped up in many other movies and TV series too. 4. 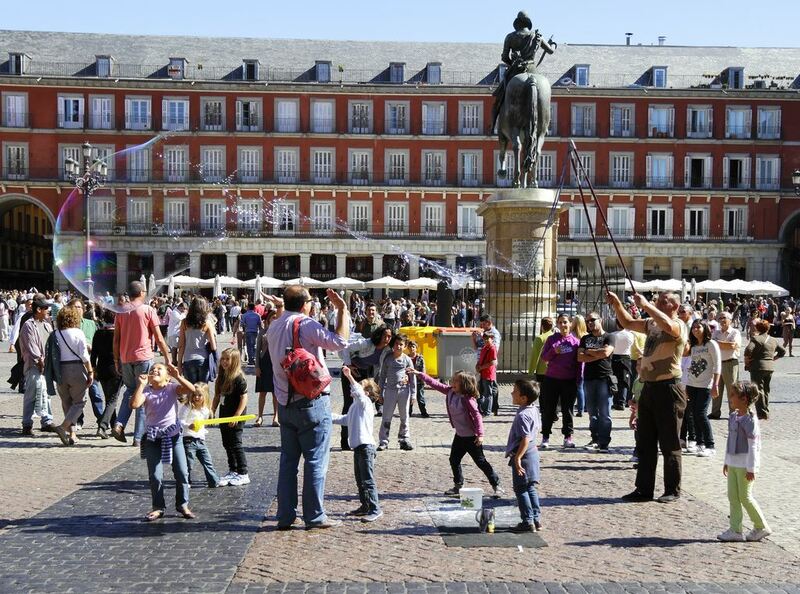 The Plaza Mayor in Madrid was opened in 1620. It was commissioned by the man you see here on horseback – Phillip III. 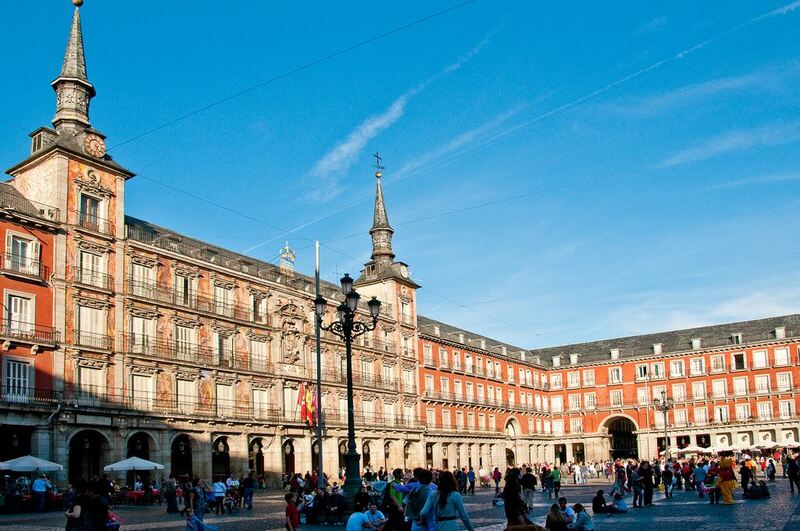 Although the most famous square in Madrid is probably the Puerta del Sol, and that’s where New Year is rung in – but we love the understated grandeur of the Plaza Mayor. If you’re passing through at Christmas, you’ll find a lovely gift market along with some great Christmas trees for sale. 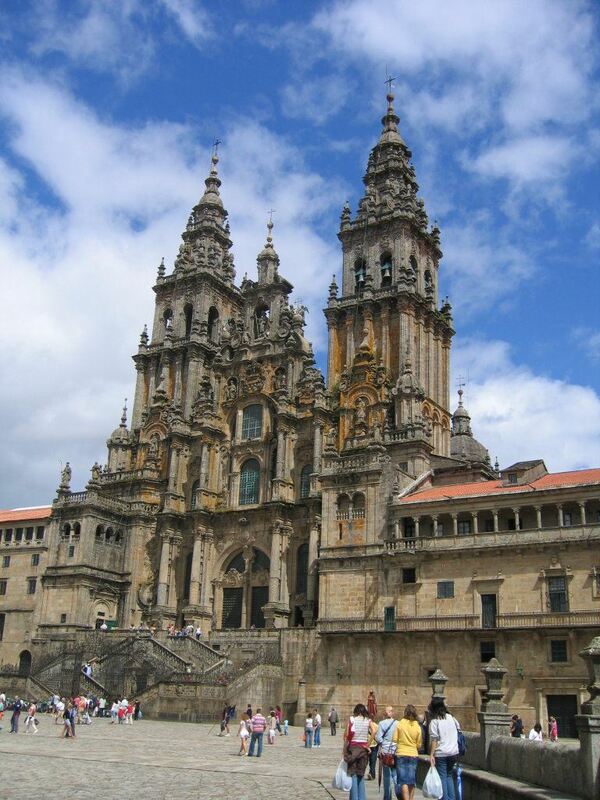 5.The Plaza del Obradoiro in Santiago de Compostela marks the end of the Camino pilgrimage route so you’ll find many a hiking boot in this plaza. In addition to the cathedral (you should try to see the swinging thurible inside), you should also visit the former pilgrim hospital on the square that is now a Parador. Have a drink at its outdoor cafe and enjoy witnessing the emotion of the pilgrims arriving at their final destination. 6. The Plaza Nueva in Bilbao was built in 1821 and is so-called to differentiate itself from the Old Square near the Ribera market. 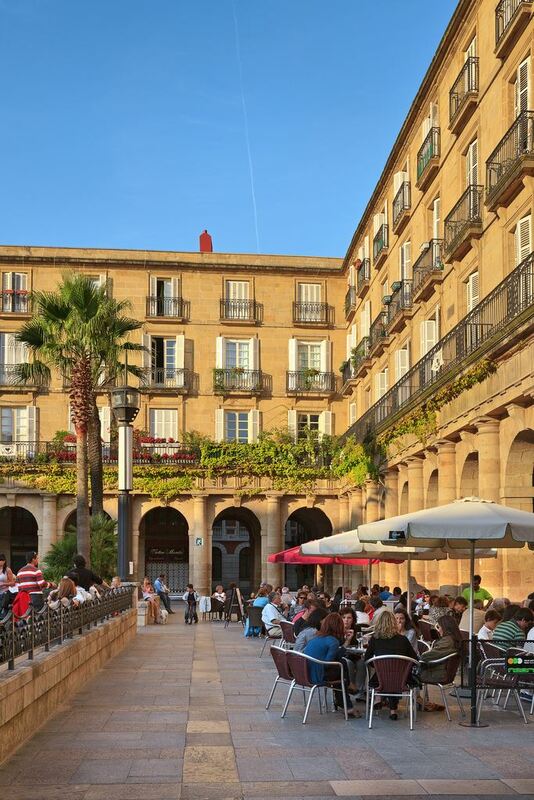 It’s a wonderfully elegant square and great for pintxos as most of the businesses under the arches are bars and restaurants that serve eye-popping creations. 7. The Plaza Mayor in Trujillo is like a history lesson in the Discovery of the Americas. First up is the statue of Pizarro (the conquistador of Peru) on horseback. The plaza is also home to three churches and many noble manors or palaces – the building of which was financed by Pizarro and his fellow discoverers. Extremadura and Spain is proud of its role in opening up trade with the Americas, and as you sit in the square (and enjoy some of the wonderful food from this area), you’ll get a sense of the countryside from where these men left and the effect the trade routes had on this town and the region. 8. The Placa Reial in Barcelona is worth the trip just to see the lampposts which were one of Gaudi’s first commissions in the city. 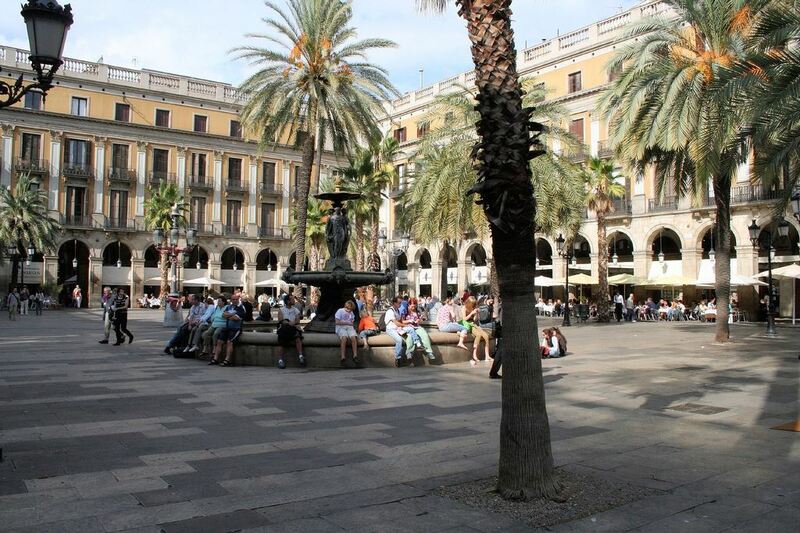 This is a well-proportioned 19th century square buzzing with tourists seeking a bit of calm from the busy nearby Ramblas. Inside the gothic quarter, it’s just a five minute walk from the wonderful Boqueria market – so perfect for a rest after visiting the market. 9. 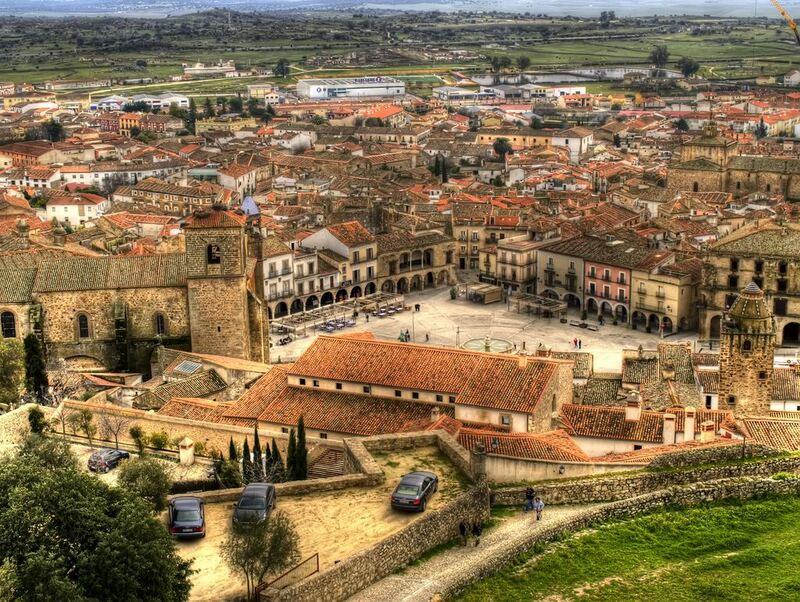 The Plaza Mayor in Pedraza oozes rural charm. Because of its distance from any main city (it’s a 90 min drive to Madrid and 40 mins to Segovia) it’s a bit lost in time and that’s why we love it. This Roman stronghold crops up in conquests, history tomes and was even part of a dowry. It doesn’t have any Gaudi lampposts but Zuloaga (1870-1945) the controversial Basque painter lived here and kept a studio in the castle. You can explore his work and his life at the museum in the castle if you need any more entertainment than the simple beauty of the plaza itself. 10. The Plaza Mayor in Chinchon is like geometry on steroids. There’s nothing at right angles in this place – and it’s this lack of uniformity that gives it such character. It’s about 45 mins by car or bus south of Madrid and is well-known in Spain for its garlic and anís festivals. There are a number of churches, towers and mansions worth exploring in the town but when we go we tend to spend our time in the square soaking up the sun and the atmosphere and enjoying its irregularity. 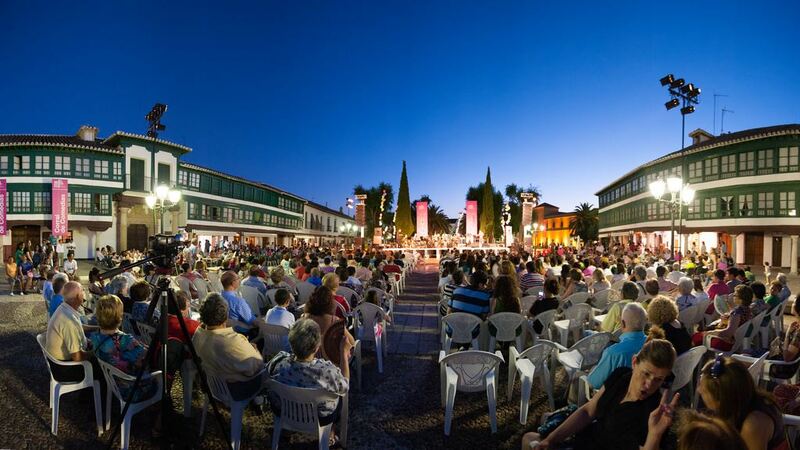 11.The Plaza Mayor in Almagro in Ciudad Real is the location for many an outdoor theatre event. The town lives for its drama festivals and if you are a fan of drama you should try to attend a performance at its annual open-air theatre in July. 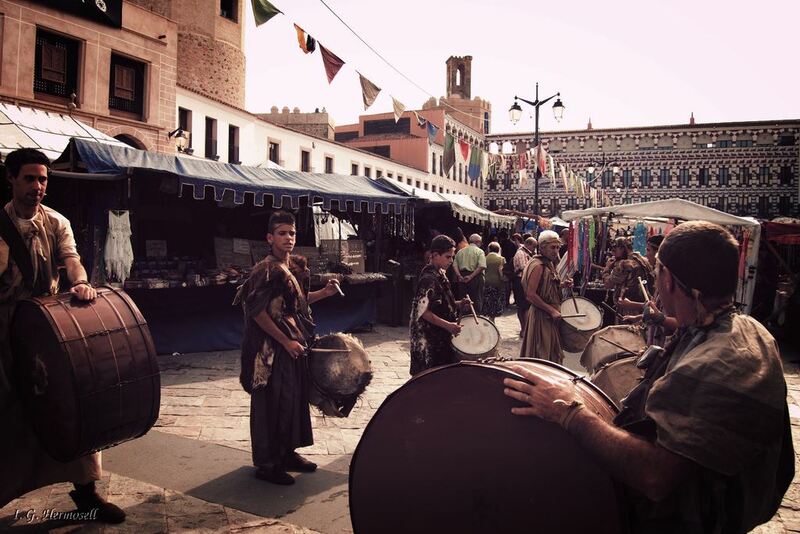 (You can read our post about open air theatres in Spain here.) We love to see the main square buzzing with people and even if you don’t understand a word that’s being said on stage, you’ll enjoy the unique setting and the electric atmosphere. You should also see its stunning Corral de Comedias theatre and the town’s theatre museum as well. Almagro is a bit off the beaten track – about 40 mins from Ciudad Real but if you’re driving from Madrid to Ubeda, Jaen or Granada, make sure to pull off the motorway and enjoy the plaza, by day or by night. 12. The Plaza Alta in Badajoz, although highly decorative, has a distinctly military feel, which isn’t surprising when you read about the history of the city on the border with Portugal. 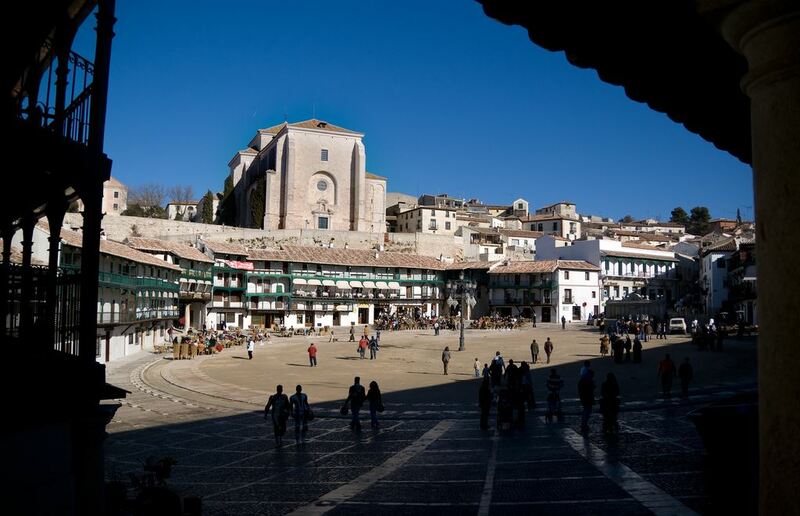 Dating from medieval times, the square was originally a Moorish zoco or marketplace. The arches were added in the 15th century to facilitate its use for bullfighting and other festivities. 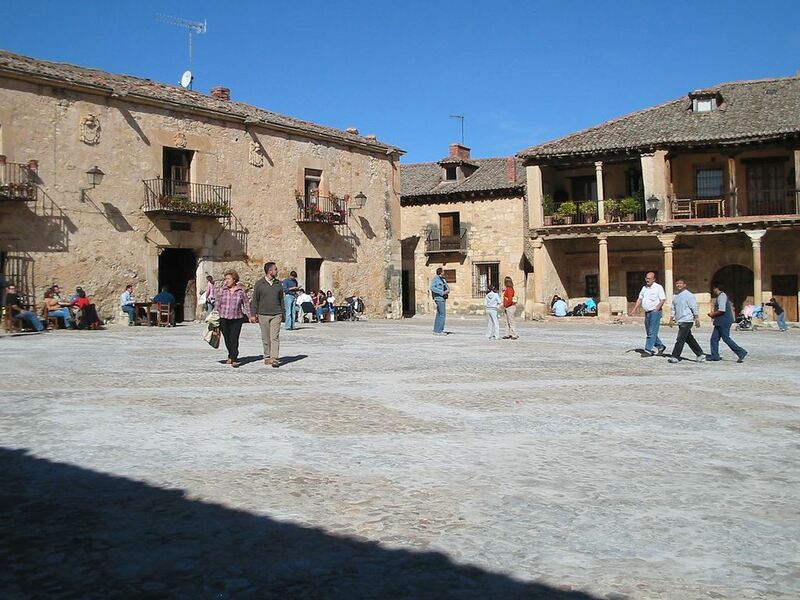 Much of the square has been undergoing restoration work – for example the Old City Hall and the Casas Coloradas. You’ll find it at its busiest during Carnival and Easter Week and during the Jazz and Classical Music festivals when the whole town spills into the square. Just one more parting plaza shot? Pro-tip: Want to experience a few of these plazas in one trip? 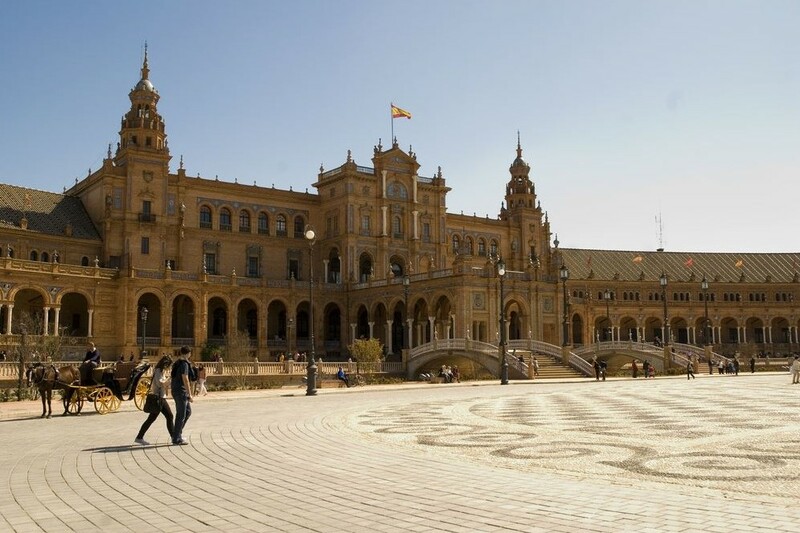 You can fly into Madrid to enjoy its Plaza Mayor, make daytrips to either Chinchon, Pedraza, Almagro and/or Salamanca, and hop on the high-speed train to visit the squares in Cordoba and Seville. Check out our posts on What to Do in Madrid, Day Trips from Madrid and Travelling by High-Speed Train in Spain. Posted in Barcelona, Bilbao, Camino de Santiago, Castilla la Mancha, Castilla Leon, Concerts in Spain, Insider Spain Guides, Madrid, Paradores, Popular Posts, Ronda, Santiago de Compostela, Seville and tagged Almagro, architecture, Badajoz, Barcelona, Bilbao, Chinchon, Cordoba, History, Madrid, Pedraza, piazzas, Placa Reial, Plaza Alta, plaza de espada, plaza del obrador, plaza mayor, plazas, public spaces, Salamanca, Santiago, Seville, Spain, squares, Trujillo, urban planning.